Also serving communities of Old Hickory. There are 31 Assisted Living Facilities in the Hendersonville area, with 7 in Hendersonville and 24 nearby. The average cost of assisted living in Hendersonville is $2,986 per month. This is lower than the national median of $3,346. To help you with your search, browse the 141 reviews below for assisted living facilities in Hendersonville. On average, consumers rate assisted living in Hendersonville 3.8 out of 5 stars. Better rated regions include Madison with an average rating of 3.9 out of 5 stars. Caring.com has helped 7 families in Hendersonville find high-quality senior care. To speak with one of our Family Advisors about assisted living options and costs in Hendersonville, call (855) 863-8283. Hendersonville, home to the late Johnny Cash and the late Roy Orbison, is located just 18 miles northeast of downtown Nashville in Tennessee. Over 50,000 residents call this community home, and 14.6 percent of the population are seniors. These seniors can choose from seven assisted living facilities within city limits and over 40 in the surrounding area. These communities are regulated by the Tennessee Department of Health Board for Licensing Health Care Facilities and are defined as facilities which provide room and board along with assisted care living services. Hendersonville has plenty of arts and culture for seniors to enjoy including Rock Castle, Spring Haven Mansion, the Drakes Creek Park and Trinity Music City. The Hendersonville Senior Center offers seniors a variety of fitness and educational programs, dances and outings. The cost of living in Hendersonville is 17.4 percent higher than the U.S. average. This is primarily due to housing and transportation costs which are 46 and 18 percent above average respectively. Health care is comparable to national medians, and groceries are slightly below which can benefit seniors on a budget. Hendersonville’s weather is seasonal with hot, muggy summers and cold, wet winters. Temperatures range from highs of 89 degrees Fahrenheit in July to lows of 26 degrees in January. Snowfall is only 3 inches per year on average, but rain falls around 50 inches annually. This variable climate may have an impact on seniors who enjoy the outdoors. Hendersonville is a safe option for seniors because crime here is relatively low. The city is safer than 43 percent of other U.S. cities and has less exposure to crime than Nashville. Violent and property crime scored 19.7 and 32.6 out of 100 respectively. Seniors who don’t drive are eligible for reduced fares on public buses provided by RTA. Mid-Cumberland Public Transit provides curb-to-curb transportation Monday through Friday for seniors residing in Sumner County. Tennessee does not have standard income tax so all income from retirement, including Social Security benefits, is not taxed by the state. This leaves extra income for seniors to put toward assisted living. Assisted Living costs in Hendersonville start around $2,986 per month on average, while the nationwide average cost of assisted living is $4,000 per month, according to the latest figures from Genworth’s Cost of Care Survey. It’s important to note that assisted living rates in Hendersonville and the surrounding suburbs can vary widely based on factors such as location, the level of care needed, apartment size and the types of amenities offered at each community. 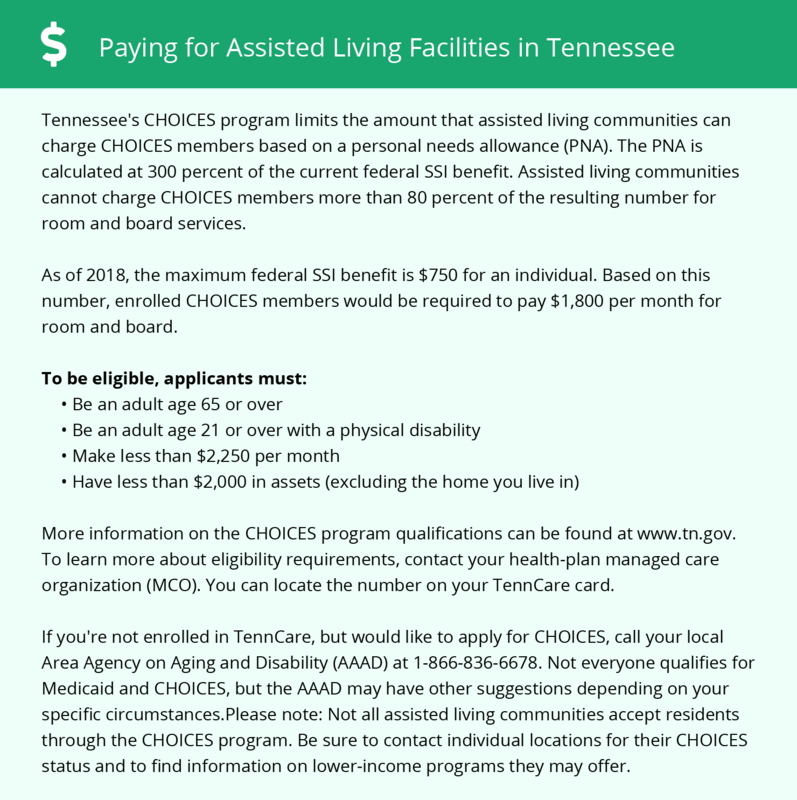 Seniors in need of financial aid for assisted living may apply through TennCare CHOICES and OPTIONS for Community Living. While these programs do not pay for room and board, they can help offset costs by providing other services such as assistance with daily living activities. Hendersonville and the surrounding area are home to numerous government agencies and non-profit organizations offering help for seniors searching for or currently residing in an assisted living community. These organizations can also provide assistance in a number of other eldercare services such as geriatric care management, elder law advice, estate planning, finding home care and health and wellness programs. To see a list of free assisted living resources in Hendersonville, please visit our Assisted Living in Tennessee page. Hendersonville-area assisted living communities must adhere to the comprehensive set of state laws and regulations that all assisted living communities in Tennessee are required to follow. Visit our Assisted Living in Tennessee page for more information about these laws.